Families love the Mountain Suite. 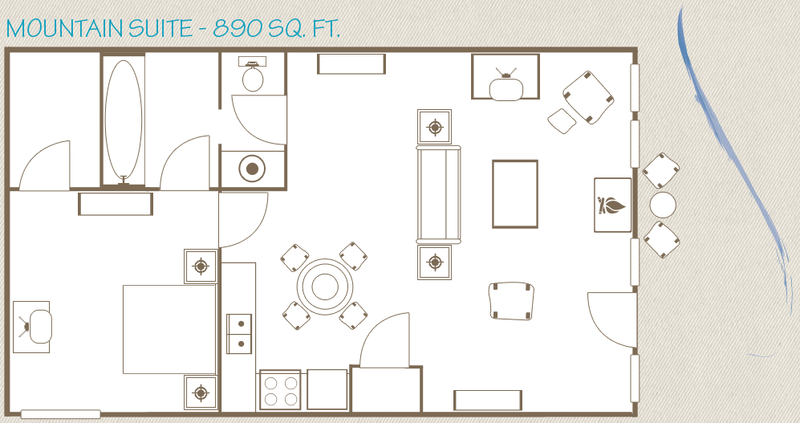 Its large living room is the perfect space for everyone to share. Whether watching a movie and enjoying a fire in the fireplace, or sitting down to a proper meal at the dining table, the Mountain Suite builds family bonds. The kitchen is comfortably equipped with a full size refrigerator, stove and oven, microwave, 8-cup coffee maker, toaster and dishwasher. Of course dishes, glasses, silverware, paper towels and dishtowels are also included. The bedroom features a luxurious queen bed, its own TV and DVD player, a walk-in closet and direct access to the bathroom. The living room has a queen size sofa bed, gas fireplace, TV with DVD player, and direct access to the bathroom, which has a shower/tub combo. While this suite does not have a private deck, it is located close to great riverfront sitting areas.